In the early months of playing Kings of War i was trying to build similar army lists to those that i had built when using Bretonnians which consisted of only mounted knight units. I soon realised that this wouldn't work in Kings of War. One of the many reasons i love Kings of War is that it forces players to build a balanced list and while min/max armies may table some players the majority of the time they will lose... in my opinion. It took me a long time to decide on what i would do for this units multi-base. I knew that this would be a unit i would most likely bring to every game so i wanted to make sure this would be a centre piece to the army. So eventually i decided to model a Weirwood. 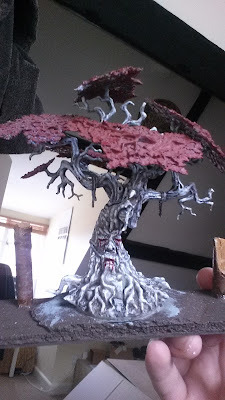 As many of you may notice i used one of the Games Workshop generic trees as the base and used modelling putty to sculpt the face into the trunk. Below you can see the base before it was painted. 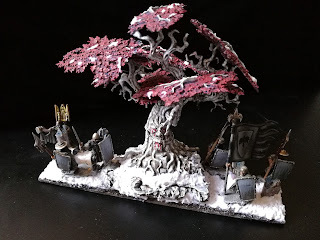 I used a thin sheet of MDF for the base and used think layers of cork building up towards the centre to give the Weirwood a more imposing presence on the battlefield. In the final version i decided to add another thick layer beneath the Weirwood as i felt it wasn't quite high enough in the image below. Finally i added small small branches and twigs to the base to look like decaying or destroyed trees. 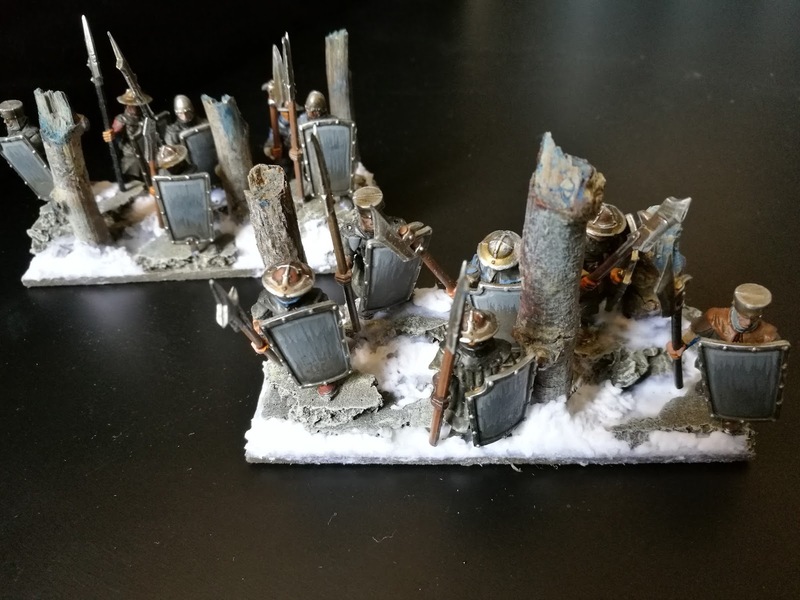 I sourced these from my local broad; there are plenty of broken and dry twigs all over the place that are perfect for wargaming terrain. I went for the broken tree look for two reasons; firstly to give the base a more of a frozen wasteland feel and secondly i thought modelling whole tress would just overshadow and distract from the effort gone into the miniatures. Once i have uploaded all of my completed work so far i will post a detailed step by step guide on how to build and paint mult-bases just like these. If you have any questions feel free to comment below. Thanks!